Nortech Staffing Solutions, part of the Nortech Group, is gearing up for growth after securing a new contract, which will expand its stable of contracted staff and create opportunities for new jobs within the company. The growth plans have been triggered after Nortech was selected to provide a managed recruitment solution for a national client, as part of a contract with a non-disclosure agreement. As a result of this new deal, Nortech will become the company’s contracted recruitment provider for its sites on Teesside and Cheshire. Nortech will source and supply a full range of personnel, covering technical and engineering, management, and administration roles. In addition to providing all new contract personnel for this prestigious client, the Teesside-based company will be responsible for the migration of around 50 existing temporary personnel working at the client’s UK sites to Nortech from a number of other recruitment suppliers. This has increased Nortech’s pool of managed contractors and will lead to the appointment of an additional recruiter to the business to support the delivery of this new contract. It is expected further jobs will be created at Nortech on the back of this contract win. Nortech Staffing Solutions is part of the integrated engineering-based services offered by the Nortech Group. Drawing on the expertise and experience from its complementary Engineering Design and Management Consultancy divisions, Nortech Staffing can provide a comprehensive and knowledge-based service. 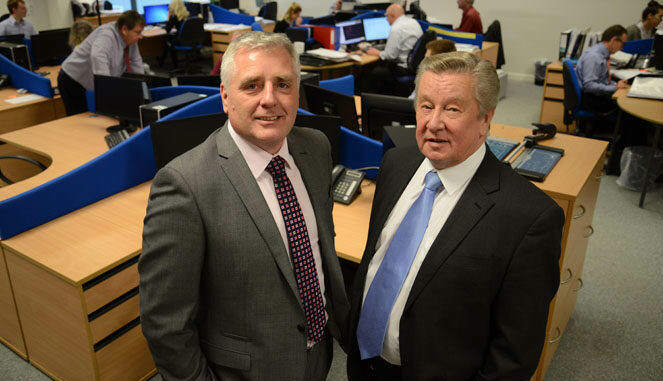 Divisional director Ian Basford, pictured above (right) with MD Bryan Bunn, said: “This is a significant contract for Nortech both in terms of the profile our new client, but also to underpin the future growth of our business. Becoming its contracted recruitment provider is also a strong endorsement of our broader engineering-based capabilities and our ability to deliver them a right-first-time service.